Ottawa summers are made for biking. With an extensive network of trails, countless cruising adventures await! The route we undertook last week, on a scorching August day was particularly delightful because it included not one but TWO special Ottawa 2017 activities celebrating Canada 150! We live in the Alta Vista neighbourhood and chose the slightly longer route along the canal to Jacques Cartier Parc. The canal path is one of my favourites, especially midweek. 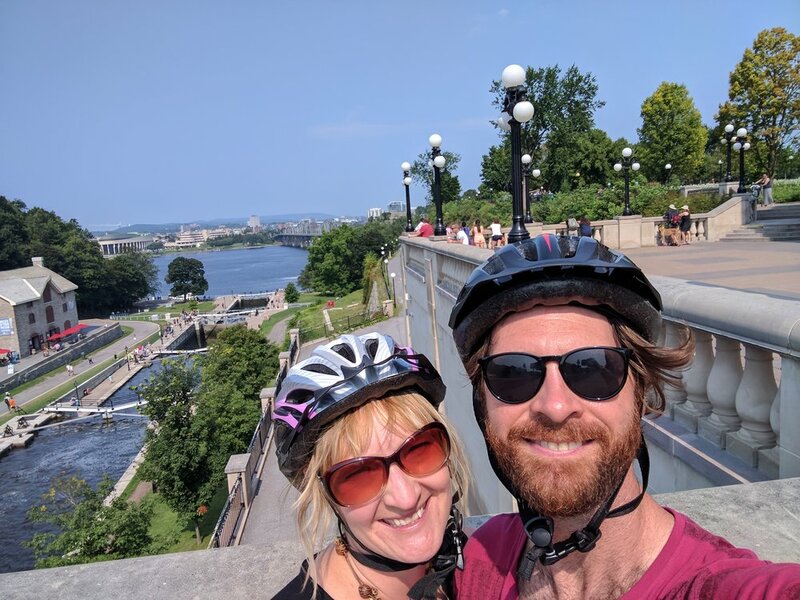 During the summer between 9am-3pm you can even bike all the way down the canal and then under the Wellington Bridge (passing RentABike Ottawa) where there’s a stairway with a bike ramp which will land you right beside the Fairmont Chateau Laurier! It’s super convenient. From there you’re pretty much in Major Hill’s Park and on to the Alexandra Bridge. Et voila! You’re at Jacques Cartier Park. There is bike parking at the entrance gate to MosaiCanada, which is helpful. The exhibit is free, and according to the website, the biggest horticultural event in Canada. I wouldn’t have believed that until I saw it with my own eyes. Not only is the display much bigger than I expected, but it is significantly more impressive than pictures can demonstrate. Even the most curmudgeonly of people will find it hard to deny the artistry, creativity and talent that went into the creation of MosaiCanada in Gatineau. Reversing your trusty bicyclette, head back over the MacDonald-Cartier Bridge. Just as you cross back into Ontario, to the right of the bridge, you'll see Tavern on the Hill. 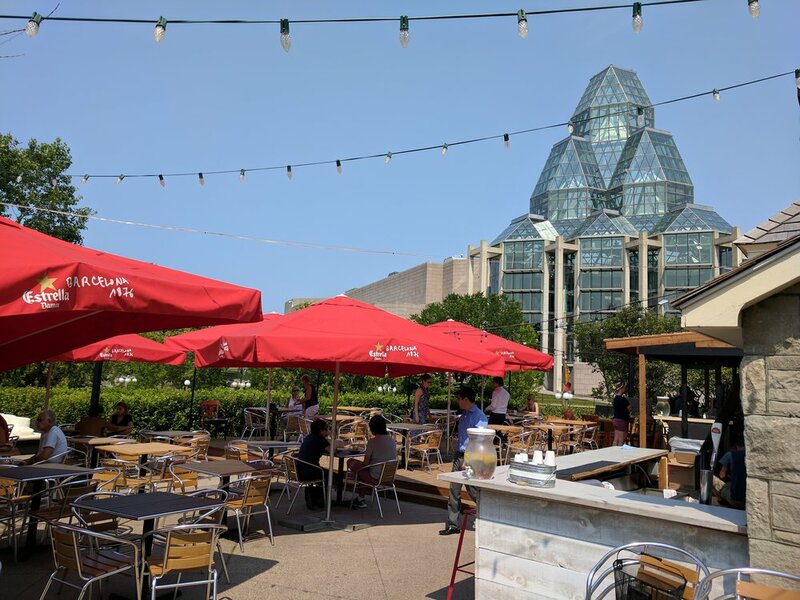 Lock your bike at the entrance and order a gourmet hotdog from the friendly cashier at the till at this heritage building/Ottawa's best new patio. Pick a table, grab a pint of local Craft beer from the bartender and enjoy the spectacular views of Parliament, the park and the art gallery. I love that the patio has plenty of shade, comfy wicker furniture, a free water jug and live music in the evening. It's been our go-to patio to bring guests to this summer. Check it out before it's under a blanket of snow! Held in an LRT rail station to-be. The Kontinuum underground laser light show is a fun, free event. I like the dual purpose of the space, using the underground tunnels for a creative outlet while the LRT is undergoing its construction. Scan your ticket upon entrance and frequency magic conjures up a huge image of you in light! Pretty cool! It will be interesting to walk through the same tunnels when the LRT is functioning and devoid of flashing lights and lasers. Interesting and, I can imagine, significantly less entertaining. Back out in the sunshine, you have some options for your next stop. Fourth possible stop: Navigate your way down to the canal a pathway and stop in at the seasonal Terrace on the Canal, an open air patio for another drink. OR: If you're heading down Bank St, stop in at the Craft Beer Market at Lansdowne for a flight. Every week a new local and international flight is available, so you do have to worry about drinking the same fabulous five beers every time you visit! Perhaps, even more compelling is the $5 14oz pints of Ontario Craft beer every weekday 3-6pm. Clearly the fact that Craft's beer specials are ingrained in my memory is a sign that we visit their patio with embarrassing frequency. What can I say, $5 Ontario beer is a pretty stellar deal for Ottawa! Stop 4a: Possibly the most important stop you'll make all day: Dessert. It's hard to miss Stella Luna, located a little further south down Bank St in the Glebe neighbourhood. It’s the award winning gelato joint with the lineup down the street. Is it worth the hype, folks? Ohhh, yes. Most definitely. Join the line and try not to drool on the sidewalk as you think of all the unique varieties of delicious, delicious gelato that await you behind the glass counter. My personal favourite is probably a tie between the rich chocolate sea-salt and white chocolate pistachio. I have no doubt that Stella Luna has a flavour to satisfy everyone! After a hard day of biking- you deserve a cold one. As Tom Haverford advises: Treat- yo- Self!